The thought of graduation conjures many images: long gowns, wonderful music, family and friends cheering from the bleachers. 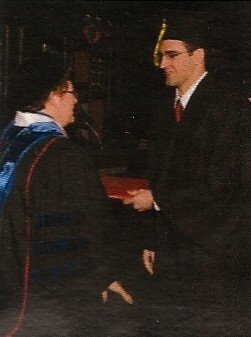 When I graduated from the University of Wisconsin-Madison in December 2008, however, those images looked less rosy, and more we all required a pocket full of posies. · The weather was awful. A winter storm had moved through the night before, leaving the roads to Madison dicey to say the least. · Everyone was in a genuinely foul mood. · I was hung over, mainly from the “Video Game Olympics” with my roommates the night prior. Norway (Hustad) emerged the victor. So, there you have it. What a sad day, right? In the end, everything was fine. The ceremony wasn’t too long. I did find a friend of a friend to sit with. My family seemed better once it was all over, especially once we got some food in everyone. I paid my penance that morning for the night prior, and started to feel better. And I did get a picture, even if it was the one-inch preview the university tried to entice me with to pony up for regular-sized prints. But what really matters is the accomplishment achieved. Whether it is a four-year college or two-year tech degree. Having that diploma to hang on the wall, set on the desk, or use as a serving tray, and being able to say, “I graduated from __________” with pride.